Tech Trends in Education. It’s not a game. . . except when it is. This activity was consuming! I make no apology for getting excited or enthusiastic. I hope that my reflections engage you in some way. If my excitement and hyperbole are too much, please forgive me. First of all, I read the 2014 The Horizon Report – several times. Barbara was correct; this will become one of my favorite pieces of reading. I was not sure where to start because there were many aspects which interested me, so I decided to go with my gut. Gaming in education. Over the last 10 years I have experimented in a haphazard way with games in education. Never really taking anything to an interactive level, what I have done is use games with children as a starting point for traditional learning. For example, using Myst to help with creative writing. My efforts in the last few years have been less and less though, and I saw this activity as an opportunity to further my knowledge, develop new skills and reignite something that I know in my heart works. I read the rest of the articles in the report and then tried to really reflect on what I should create. I came to the conclusion that to wax lyrical about the benefits of games in education without being a player was disingenuous. So how could I play? I decided that I would sign up for and create an account using 3D Game Lab. I had no idea that its origins were in Boise State until I read the website. That hometown link only solidified my desire to participate, so I signed up for an educator account. Over the next week, I completed 13 ‘quests’ which were designed to explain how to go about creating and designing learning experiences with the system. After about 20 minutes, I decided that my artifact would have to be a Quest. 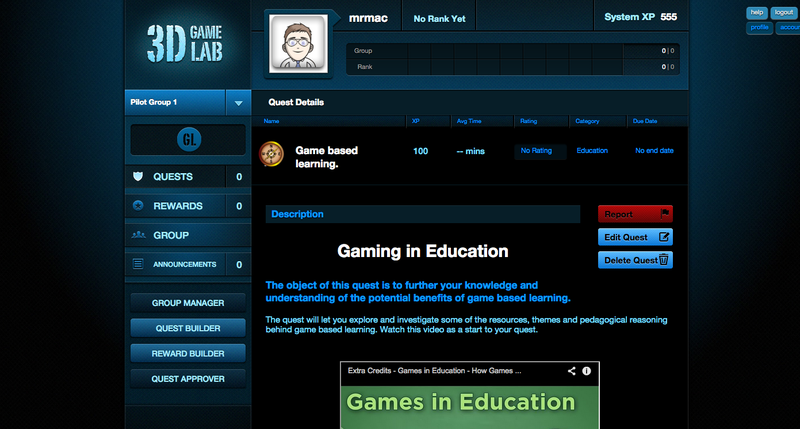 I decided to create a simple quest on the topic of game based learning. In order to to this I had to successfully complete quests which unlocked certain tools for me. I then collected some resources together and set about making a quest of my own. My first attempt is pretty simple and basic. Aimed at teachers like myself who are brand new to the topic, the activity requires that the participant watches a video and explores 3 different websites in order to create a reflective piece of work which can be in any form. I was attempting to use Universal Design for Education (UDL) principles for the assignment aspect. The reflections can be completed in any way that can be shared with a url. The player must submit their response to me and will earn a number of XP (experience points) for submitting. I created badges, awards and achievements for players. It has been consuming, and the learning curve is quite steep. However, I see this quest as something more than just an artifact for the course. It is not something I have created, but a seed I have sown. It will grow and develop. At the moment I have a group with no participants and one little quest. My goal is by the end of December to have a group established for pupils in our school to support their literacy and maths. It might be 3 or 4 pupils or it could grow to many more. Maybe someone who reads this will join the groups and complete the quest! I have learned the following things. This is not a fad and affords great opportunities for learners to lead their own learning and engage. I have a lot more to learn, and in this case learning by doing is important. I don’t think it is possible to create effective game based learning experiences unless you can think like a player which means be a player. I come away with a feeling similar to the one I had while researching flipped classrooms for my EdTeach 543 class which was that, it is not about flipping the classroom, it is about flipping the learning to achieve a better learning experience. With game based learning, it is not about just using a game to deliver the same old content in a new way, it is about creating an experience where the student has deeper learning experiences. I was not sure how to share or demonstrate my artifact, so I have created a google slideshow with screenshots of my journey through 3D Game Lab and the quest that I created. That way I have evidence for those who do not have an account. Here is a link to the slideshow. I hope that someone joins in!